The Friday Breakthrough is Ottawa’s weekly roundup of some of the Internet’s best marketing and social media articles for a less-than-intense day at the office. For the duration of the Winter Olympic Games, the Friday Breakthrough will be dedicated to reviewing The Good, The Bad and The “What Were They Thinking? !” of the marketing of the Vancouver Olympics. Part Three: What Were They Thinking? And now, the hot mess of Olympic marketing blunders. First up, I must discuss the train wreck of Olympic uniforms that we had to endure during the Olympic ceremonies. Don’t get me wrong, I loved a lot of countries’ Olympic threads, but some were so hideous. (And yes, for any naysayers, Olympic gear has EVERYTHING to do with marketing). Germany takes the cake on the worst uniforms. Pink for girls and blue for boys – I wish I were kidding. Sure, my fashion expertise is limited to episodes of “Project Runway” and my LouLou subscription, but I mean come on! Heidi Klum must be throwing up right now. I couldn’t seem to find a pick of the German uniform disaster, but look for them during closing ceremonies. Trust me, you won’t miss team Deutschland. It’s a bad fashion wreck, you won’t be able to take your eyes off. Also, there’s a good chance you’ll feel better about your grade 8 sewing assignment in Home Ec class. 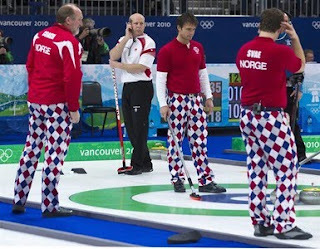 Don’t worry, I wouldn’t have you walk away without viewing a most excellent Olympic fashion faux-pas, I have included a pic of the Norwegian curling team. Next up: bandwagon jumping of provincial tourism served up with the subtlety of Kanye West. Sure, the spirit of the Olympic Games has always diluted by the onslaught of advertising, sponsorship and press, but am I the only one who finds the constant running of the B.C. and Ontario tourism ads blatant attempts to cash in? I just have one question for British Columbia Tourism: How many of them ACTUALLY call B.C. home? My apologies for not attaching the soon-to-be classic Clara Hughes spot, blame it on YouTube. If you’re any Olympic fan at all, you’ve already seen it 74 times at least and if you haven’t – go watch the Olympics! I hope you enjoyed this three part series, I sure did. Be sure to catch our post-Olympic Friday Breakthrough next week.